Welcome to DisneyMouseLinks. 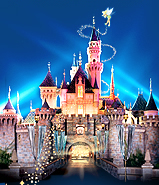 While this site specializes in visiting Disneyland with toddlers and babies there is also plenty of unique Disneyland information for the young at heart. The Disneyland Resort Vacation Planning Guides contain information dealing with the huge task of planning a successful Disney Resort vacation while the Disneyland Resort Guides are filled with useful information on what to do while at the Disneyland Resort. What's Happening At Walt Disney World? Disney isn't always a 'magical' company that can do no wrong. Disney is a multinational fortune 100 corporation whose main goal is to make money. 'The State of Disney' is a hard look at the Disney business minus the pixie dust. All 'State of Disney' articles. What was Disney Thinking This Time? Engorged Ticket Prices! Alex, who has been visiting Disneyland and Walt Disney World since he was 14 months old, is now writing his own articles about Disney. Alex In His Own Words is his collection of articles on Disney. Leanne at DisneyMouseLinks.com has a lot of pent up Disney knowledge that she feels she needs to share with the world. A Little Dose Of Disney is her new 'blog style' collections of articles on everything Disney. Continue reading Disney's Club Penguin Frozen Party!